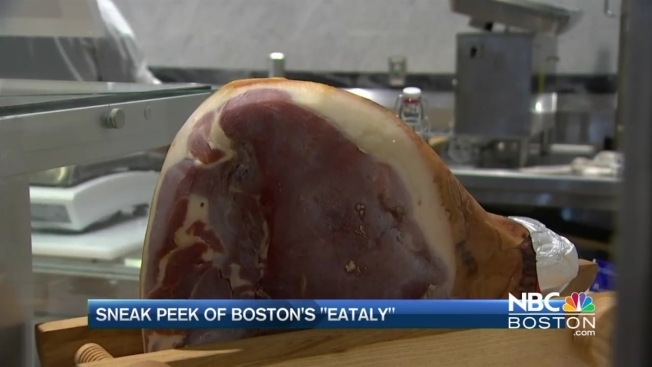 Eataly Boston is set to open on Nov. 29 inside Boston's famed Prudential Center. "Boston was a no brainer," said CEO Nicola Farinetti. Farinetti said when he visited the North End, he was inspired to build an Eataly in Boston. He also pointed to the city's college scene as an excellent way to reach young people. "It's a good age to try and make them understand what you put into your body is more important than what you put outside your body," said Farinetti. Celebrity chef and Eataly partner Mario Batali also explained that Eataly is not just a store, it's an experience. "You can come in and taste a million things, try a thousand wines, but it's really about the education," he said. "It's about informing the customer on how to make their own decisions. There is also a cooking school inside Eataly Boston, so you can learn how to use the ingredients you can buy in store." Walking around Eataly, you'll see there are individual sections devoted to cheese, wine, pasta and meats. Since this location is in Boston, there's also a seafood section, which encourages shoppers to try different fish in hopes of creating a more sustainable fishing environment. Famed Boston Chef Barbara Lynch was personally brought in by Mario Batali to consult on the seafood element of Eataly Boston. She says she was happy to share her knowledge of the local fishing industry. "This is a commitment to the public," Lynch said. Farinetti said this new Eataly is bringing 600 jobs to Boston. It's also working with local farms and vendors to supply the store with plenty of locally sourced goods.